The Board of Directors ("Board") of Malaysia Building Society Berhad strongly believes in the importance of corporate governance and is fully committed to ensure that the highest standards of corporate governance and integrity are applied throughout the Group. In addition, the Board also considers and adopts where appropriate, the principles and best practices of corporate governance as prescribed in the Malaysian Code of Corporate Governance 2012 ("Code") and those outlined by other regulatory bodies such as Bank Negara Malaysia's guidelines on Corporate Governance. The Board is pleased to report to shareholders the manner in which it has applied the Principles of the Code and the extent to which it has complied with the Best Practices of the Code, pursuant to Paragraph 15.25 of the Main Market Listing Requirements of Bursa Malaysia Securities Berhad ("Bursa Malaysia") and Corporate Governance Guide: Towards Boardroom Excellence, throughout the Financial Year 2016. The Board is responsible for overseeing the conduct of the Group's business and the Management's implementation of the Group's strategic objectives as well as its conduct and performance. The Board is supported by various Board Committees and Management Committees ("the Committees"). The roles and responsibilities of the respective Committees are clearly outlined in Terms of Reference and the Approving Authority Manual which requires regular review and approval by the Board from time to time. Any decisions which are not within the Committees authority would be escalated to the Board with the Committees' recommendation. 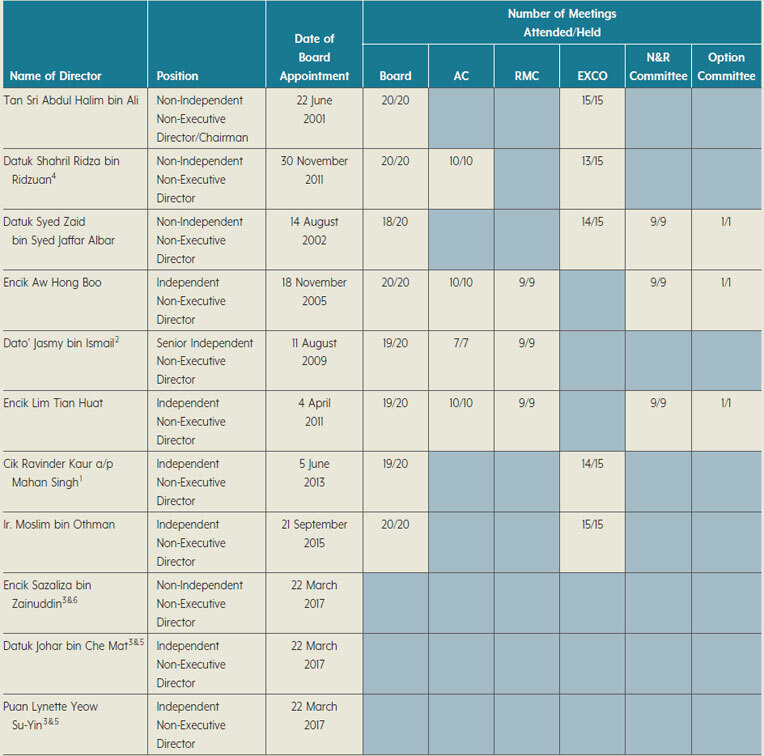 The Terms of Reference of the Executive Committee ("Exco"), the Audit Committee ("AC"), the Risk Management Committee ("RMC"), the Nominating & Remuneration Committee ("N&R Committee"), the Credit and Rehabilitation Assessment Committee ("CARAC"), Initial Alert Report Committee ("IAR"), the Asset Liability Committee ("ALCO") and the Board Charter had been reviewed and updated during the year to reflect the necessary changes in the internal process and regulatory requirements to ensure operational efficiency as well as compliance with the relevant regulatory requirements. Although the Board had entrusted its' Committees with specific responsibilities to oversee the Group's affairs in accordance with their respective Terms of Reference, the Board remains responsible and keep abreast with the key issues and decisions made by the respective Committees through the reports escalated to the Board as well as the Minutes of meetings which capture the detailed deliberation and subsequently tabled to the Board for notation. k Overseeing the selection, performance, remuneration and succession plans of the President and Chief Executive Officer ("PCEO") and Key Responsible Persons. The Board plays an active role in developing, evaluating and monitoring the Group's strategic direction by providing valuable advice to the Management based on the collective competency and knowledge of its members. The Management presents the Business Plan for the Group to the Board on an annual basis together with its' recommended strategy and budget. At this specific session, the Board together with the Management, review, deliberate and thereafter deliver the best outcome for the Group. The key deliberations during the Business plan presentation includes the current limitation of the Group, the challenges in the industry, the proposed strategies to overcome the limitations and challenges, the proposed specific programmes as well as the financial projections. The Board then reviews and approves the budget for the ensuing year and Key Performance Indicators ("KPIs") for the respective business units. The Board is also responsible to ensure that the Group is responsive to changes in the business and economic environment when pursuing and achieving the planned goal and objectives. The Business Plan and budget approved would be reviewed after 6 months and revised if necessary. In June 2016, the Board together with the Management had conducted a mid-year review on the performance of the Group. The actual performance of the Group was compared against the Business Plan, budget and KPIs approved by the Board. The challenges, key issues and the implications were identified and the moving forward action plans and strategies were discussed in the meeting. The PCEO is entrusted by the Board for developing and ensuring the Group's strategies and Corporate Policies are effectively implemented. The PCEO is responsible to keep the Board fully informed of all important aspects of the Group's operations and ensuring that sufficient information is distributed to the Board. The PCEO is supported by a group of experienced Senior Management personnel. Various Management Committees have been established to oversee the day to day business affairs of the Group and to ensure that the Board's decisions are implemented effectively. The roles and responsibilities of the various Management Committees are clearly defined in the Terms of Reference of the respective Management Committees and the salient terms are outlined in the Statement on Risk Management and Internal Control of this Annual Report. To ensure effective oversight and monitoring of the Group's business, the Group Risk Management ("GRM") Division and Compliance Division are required to submit the various reports to the RMC and subsequently the same reports would be escalated to the Board for deliberation/notation. Internal Audit Division ("IAD") also plays a vital role in overseeing the conduct of the Group business. IAD performs systematic and regular reviews on key processes to assess the efficiency and adequacy of the internal processes. The IAD reports on the periodic review are submitted to the AC for review/deliberations. The detailed functions of the GRM Division, Compliance Division and IAD are detailed out in the Statement on Risk Management and Internal Control and the Report of the Audit Committee of this Annual Report. The Board, through the RMC is responsible to ensure that a clear policy that defines the risk management of the Group is in place. In this connection, the RMC had, upon the recommendation by the GRM, established the Group's risk appetite framework which act as the main reference document in matters relating to the Group's risk management activities and serve as a guide to GRM Division in monitoring risk management practices. The risk appetite framework also assists the Management and the Board in managing risk within the Group, where the business activities are mainly risk-taking in nature. The respective heads of business units are responsible in monitoring the compliance of their business activities to the approved risk appetite in the framework and the GRM Division is responsible to monitor the risk limits sets by the Board and to report any limit breaches or exceptions to the Management, RMC and the Board. The reports include type of breaches, rationale (cause or reason leading to the breaches) and action plans taken to rectify the situation. The Board, through the N&R Committee is responsible for ensuring continuity of leadership and long term retention and succession planning for the Group. The Board and the N&R Committee have requested the Human Capital Division to constantly review the succession plan for the Group and to ensure that the successors for the respective key senior management positions are identified and recommended to the PCEO/N&R Committee/ Board for approval, if required. The Terms of Reference of the N&R Committee provides that the Committee is responsible to consider and recommend to the Board the appointment, promotion, resignation, retirement, removal and other related issues involving the C Suites position whilst the decisions on appointment, promotion, resignation, retirement, removal and other related issues involving the Head of Business functions have been delegated to the PCEO. In order to ensure that the key senior management personnel are of high caliber and competent for managing the affairs and operations of the Group, a policy of the Fit and Proper Requirement have been established. All the key senior management which defined as key responsible persons for the Group and the Company Secretary are required to be assessed and will need to meet the minimum fit and proper requirements as defined in the policy. The Board recognises the importance of communication and proper dissemination of information to its shareholders, investors and all other stakeholders including the general public. In this respect, the Board have established the shareholder communication policy with an aim to effectively provide shareholders and investors with information that fulfil transparency and accountability. The Directors will ensure that the Group keeps the shareholders informed via announcements and timely release of quarterly financial reports, press releases, annual reports and circulars to shareholders. As part of the Group's initiatives, the PCEO together with the Chief Financial Officer and the Corporate Planning and Communications Division conduct discussions, dialogues and briefings with fund managers, financial analyst and media, as and when necessary and/or after the Group's quarterly financial results are released to Bursa Malaysia. This is to promote better understanding of the Group's financial performance, operations and other matters affecting shareholders' interest. The Board is ultimately responsible for the adequacy and integrity of the Group's internal control systems. The details of the monitoring process are available in the Statement on Internal Control and Risk Management of this Annual Report. The Board has established the Directors' Code of Ethics which was adopted from the recommended Code of Ethics for Directors issued by the Companies Commission of Malaysia. The Directors observe the Code of Ethics in performance of their duties and they fully subscribe to highly ethical standards and take into account the interest of all stakeholders. The Code of Ethics for Directors is available on MBSB's website at www. mbsb.com.my > Corporate > Investor Relations > Corporate Governance > Code of Ethics for Company Directors. (vi) to ensure fair and equitable treatment of all customers and others who rely on or who are associated with MBSB. To ensure adherence to the guidelines, the Management of MBSB had taken steps to establish effective monitoring process i.e. all staff are required to sign a declaration on their observance of the guidelines and to assign responsibility to the head of various divisions/departments to ensure compliance with these guidelines on day-to-day basis and to handle general enquiries from staff on matters relating to the code of conduct. The breaches will be reported and will be recorded and kept under the custody of Human Capital Division. The Directors are also at all times be required act honestly and use reasonable care and diligence in discharging their duties and avoiding any conflict of interest. A policy to provide a systematic mechanism for disclosing potential and actual conflict of interest has been established. The Directors interested in certain transactions are required to abstain from any reporting, discussion or vote on issue that give rise to the conflict. The interested Director is required to be absent from the meeting during such deliberations and the Company Secretary shall record each Director's conflict of interest disclosed at the meeting in the minutes of meeting. The Group has in place the Complaint and Whistle Blowing policy to provide an avenue for the employees to raise concerns without fear of reprisal and to promote highest possible standards of ethical and level business conduct. The said policy clearly spells out the process flow to guide the employees to raise their concerns and the assurance that the whistle blower will not be at the risk of reprisal as a result of raising the concerns. The Group also has in place a Fraud and Corruption Control and Guidelines in managing the risk of fraud and corruption which should be read together with the Complaint and Whistle Blowing Policy. All employees are entrusted with the responsibility to stay alert for preventing and detecting defalcations, misappropriations and other irregularities. The policy sets out the specific roles of employees in prevention and detection of fraud and fraud discovery reporting as well as the procedures and processes the Company will take in respect of employees involved in fraudulent acts. A Sustainable Steering Committee reporting to the Management Committee has been established to develop the sustainability reporting framework for the Group. Three (3) workshops had been conducted in 2016 to enable the Committee to understand the sustainability and to determine how sustainability relates to the Group's business and thereafter to develop the Group's sustainability strategy and framework. The Group's publishes its Sustainability Report which outlines in detail the efforts and initiatives undertaken by MBSB for the benefit of its stakeholders. The detailed Sustainability Report of the Group forms part of this Annual Report. Prior to the Board Meeting, the agenda and a set of Board papers relevant to the business of the meeting are circulated to all Directors on a timely basis i.e. at least three (3) business days prior to the meeting date for Directors to study and evaluate the matters to be discussed. Urgent papers may be presented and tabled at the meetings under a supplemental agenda. The Board encourage paperless environment as part of the Group's green initiative. The digital copies of the meeting papers are provided to the Board/Board Committees instead of hard copies. The digital copies of the papers are uploaded to the system to allow easy access of documents in a timely and more efficient manner. The PCEO, Senior Management and relevant external consultants are invited to attend the Board meetings to brief and provide details on matters relating to their areas of responsibilities and also to provide details to the Directors on recommendations or reports submitted to the Board for deliberation and consideration. The Board has full and unrestricted access to all information within the Company and Group as well as the advice and services of Senior Management and Company Secretaries in carrying out their duties. The Board may raise the request to seek independent professional advice at the Board Meeting/ Board Committee meetings. The Management upon direction from the Board/Board Committee would engage the independent advisors to provide their professional advise at the Company's expense. Both the Company Secretary and the Joint Company Secretary of MBSB are qualified to act as Company Secretary under Section 235 of the Companies Act, 2016 and they are Associate members of Malaysian Institute of Chartered Secretaries and Administrators ("MAICSA"). The Company Secretary also possesses legal qualification. The Company Secretaries demonstrates ongoing support in advising and assisting the Board on matters relating to the affairs of the Company, including issues pertaining to compliance, corporate governance and best practices, boardroom effectiveness and Directors' duties and responsibilities including disclosure of their interest in securities, disclosure of conflict of interest in transactions, prohibition on dealing in securities and restrictions on disclosure of price sensitive information. The responsibilities of the Company Secretaries include ensuring that the Directors have access to knowledge and training they need. The Company Secretaries also ensure that deliberations at Board and Board Committees meetings are well documented and communicated to the relevant Management for appropriate action. The Board and Board Committees are also updated by the Company Secretaries on the follow-up of its decisions. In order to ensure that information flow smoothly between the Management and the Board, the Company Secretary is also appointed as the Secretary of several Management Committees including Management Committee ("MANCO"), CARAC, ALCO and Information Technology Steering Committee. All Directors have access to the advice and services of the Company Secretaries. The Company Secretaries constantly keep themselves updated with the changes to regulatory requirements through attendance at relevant conferences and training programmes. The Company Secretaries are required to fulfil the Mandatory Continuing Processional Development requirements imposed by MAICSA. The Directors are guided by the Board Charter which clearly identifies the Board's role, duties and responsibilities. The Board Charter also outlines the processes and procedures to ensure the effectiveness and efficiency of the Board and its Committees. The Board Charter is a dynamic document and will be updated from time to time to reflect changes to the Company's policies, procedures and processes as well as amended rules and regulations of the relevant authorities. The Board Charter was last revised in February 2017. The complete Board Charter is available on MBSB's website at www.mbsb.com.my Corporate > Investor Relations > Corporate Governance > Board Charter. The N&R Committee currently consists of three (3) Independent Non-Executive Directors and one (1) Non-Independent Non- Executive Director and it is currently chaired by Dato' Jasmy bin Ismail, the Senior Independent Director of MBSB. f. To consider and recommend to the Board the appointment, promotion, resignation, retirement, removal and other related issues involving the C Suites position as defined in the policy for the Fit and Proper Requirements. g. To delegate to the PCEO the responsibility for fit and proper assessment and decision on appointment, promotion, resignation, retirement, removal and other related issues involving the Head of Business functions as defined in the policy for the Fit and Proper Requirements. 3. Fulfil the fit and proper criteria as per the applicable guidelines by the relevant authorities. m. To assess and recommend accordingly the training needs of the Board members and any proposed changes to the training budget. The Board had adopted the Boardroom Diversity Policy which covers diversity in terms of professional experience, skills, knowledge, education and background, age, ethnicity, culture and gender. The diversity of skill, experience and knowledge of its members in various disciplines and profession allows the Board to address and/or to resolve the various issues in an effective and efficient manner. The brief description of the background and experience of each of the Board member is contained in the Directors' Profile section of this Annual Report. The Board recognises the challenges in achieving the right balance of diversity on the Board to form a highly effective Board in today's competitive business environment. The Board is committed to Board diversity and will ensure that all appointments to the Board will be made based on merits while taking into account the Company's needs and circumstances, present size of the Board, suitability for the role, skills, experience, knowledge, experience and diversity. i. While it is important to promote gender diversity, the normal selection criteria based on an effective blend of competencies, skills, extensive experience and knowledge to strengthen the Board should remain a priority. ii. The N&R Committee is responsible in ensuring that gender diversity objectives are adopted in board recruitment, board performance evaluation and succession planning processes. iii. The Company shall provide a suitable working environment that is free from harassment and discrimination in order to attract and retain women participation on the Board. The Board comprised of Directors in varying ages, ranging from 44 to 73 years old. The N&R Committee had during the year reviewed the composition of the Board and was of the view that there was a need to appoint additional Directors. The Board and N&R Committee had discreetly obtained the curriculum vitae of the potential director candidates through various external sources and the shortlisted candidates were recommended to the N&R Committee for evaluation. The N&R Committee had conducted fit and proper assessment on the candidates and interaction sessions with the candidates were held first prior to recommendation to the Board for approval. i. Probity, personal integrity and reputation – person must have the personal qualities such as honesty, integrity, diligence, independence of mind and fairness. ii. Competence and capability – person must have the necessary skills, experience, ability and commitment to carry out the role. iii. Financial integrity – person must manage his debts or financial affairs prudently. The N&R Committee had evaluated 6 female candidates and 3 male candidates in 2016 and 2017 (as at March 2017). 4 candidates have been shortlisted and recommended to the Board for approval. The Board had approved and appointed 1 female director and 2 male directors on 22 March 2017.
a. Reviewed and recommended the re-appointment and re-election of Directors at the 46th Annual General Meeting ("AGM"). b. Reviewed and recommended the Directors' Fees for year 2016.
c. Reviewed the composition and mix of Board/Board Committee's skills/experience. d. Reviewed and recommended the performance bonus and salary increment of all staff including the PCEO. e. Deliberated and recommended to the Board on the Appointment/Resignation of C suites personnel. f. Reviewed and recommended the appointment of additional AC member. g. Reviewed and recommended the appointment/ resignation of Independent Non-Executive Directors. h. Reviewed and recommended the appointment of additional Non-Independent Non-Executive Director. i. Reviewed the revised terms of the Nominee Directors of Employees Provident Fund Board. j. Reviewed and recommended to the Board the amendments to the Terms of Reference of the N&R Committee. k. Reviewed the performance of Shariah Advisory Committee members. l. Reviewed and recommend the re-appointment of Shariah Advisory Committee Members. e. To consider and recommend to the Board the promotion, remuneration package, increment, bonuses and other related matters involving the C Suites position as defined in the policy for the Fit and Proper Requirements. f. To delegate to the PCEO the decision on the promotion, remuneration package, increment, bonuses and other related matters involving the Head of Business functions as defined in the policy for the Fit and Proper Requirements. h. The Committee, when considering and recommending where appropriate will take into account that such recommendation/remuneration package/programmes and other related matters should reflect and commensurate with the accountability, duties and responsibilities of the abovesaid parties under consideration. A formal Directors Remuneration Framework has been established. It is tailored towards attracting and retaining Directors with relevant experience and expertise needed to assist in managing the Company and the Group effectively. 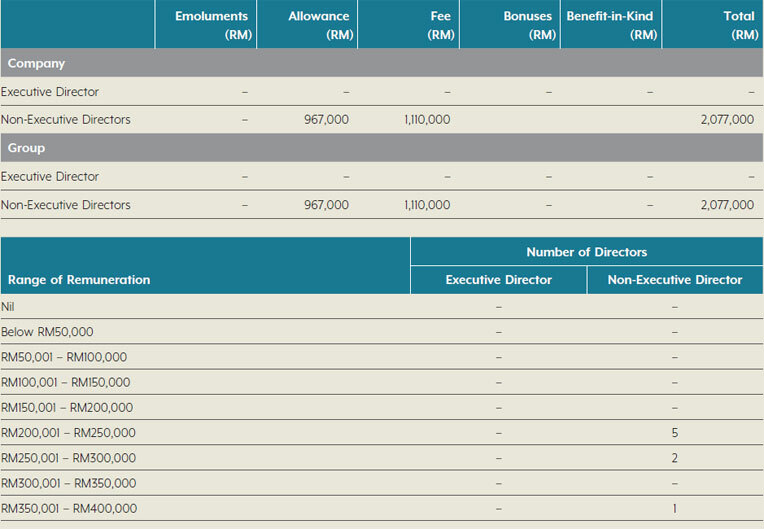 The level of remuneration for the Directors shall be determined and recommended by the N&R Committee to the Board after giving due consideration to all relevant factors including the Directors fiduciary duties, time commitments expected of the Directors, Company's performance, market conditions as well as the compensation level for comparable positions among other similar Malaysian public listed companies. The remuneration payable to Directors is determined by shareholders resolution in accordance with the Companies Act, 2016 and Company's Articles of Association and shall not be increased except in pursuant to a resolution passed at a general meeting. Details of the Directors' remuneration of each Director during the financial year 2016 are set out under Note 30 of the Notes to the Financial Statements in this Annual Report. v. Ability to act in the best interests of the Company and the Group. In addition to the annual assessment on the Directors' independence, each Independent Director is required to submit an annual declaration on their independence. The Board noted Recommendation 3.2 of the Code that the tenure of an independent director should not exceed a cumulative term of nine (9) years. The Board is of the view that the ability of long serving independent director to remain independent and to discharge their duties with integrity and competency should not be measured solely by tenure of service or any pre-determined age. Their long service should not affect their independence as they are independent minded and had provided necessary checks and balances in the interest of the shareholders. Further, the continued tenure of directorship brings stability to the Board and the Company benefits from directors who have over time gained valuable insight into the Group, its market and the industry. The N&R Committee had assessed the independence of Encik Aw Hong Boo who has been an Independent Non-Executive Director since 18 November 2005 and had recommended for Encik Aw to continue to serve on the Board of MBSB as Independent Director of MBSB. In accordance with the best practices on Corporate Governance, Dato' Jasmy bin Ismail was appointed as the Senior Independent Non-Executive Director on 19 January 2017, in place of Encik Aw Hong Boo, who was re-designated as Independent Non- Executive Director. 4. act as a trusted intermediary for Non-Executive Directors where this is required to help them to challenge and contribute effectively. There is a clear division of responsibility between the Chairman and PCEO to ensure a proper balance of power and authority. The Chairman of the Board is a Non-Executive Director and together with the rest of the Board, is responsible for setting the policy framework within which the Management is to work. The Chairman also leads the collective effort of the Board in monitoring the performance of Management in meeting the corporate goals and objectives. He also guides the Board on all issues presented before them at meetings or at such other forums where the consensus of the Board is required. The PCEO is primarily responsible for overseeing the day to day management to ensure the smooth and effective running of the Company and the Group. He is entrusted with making sure that all decisions, directions, policies and/or instructions approved by the Board are carried out by Management in a timely and efficient manner. He carries the primary responsibility in ensuring management competency including the emplacement of an effective succession plan to sustain continuity. The Board currently comprise of ten (10) Directors of whom six (6) are Independent Non-Executive Directors and four (4) are Non-Independent Non-Executive Directors. The Independent Non-Executive Directors are independent of Management and free from any business or other relationship with the Company and the Group which could materially affect the exercise of their independent judgement. The number of Independent Directors not only fulfil the requirement of Bursa Malaysia for one-third of Board membership to be independent but also contributes towards greater impartiality and objectivity in the Board's decision making process. The N&R Committee reviews the Composition of the Board on yearly basis and the same is tabled to the Board, to ensure that the optimum size of the Board is achieved to enable effective oversight and delegation of responsibilities to encourage the active participation of all directors in Board/Board committees. The Chairman of the Board is YBhg Tan Sri Abdul Halim bin Ali, a Non-Independent Non-Executive Director. Although the Chairman is a Non-Independent Director, the Board composition comprising a majority of Independent Directors can bring expertise and objectivity which will assure that the Company is effectively managed and in the best interest of stakeholders. A formal and transparent procedure has been established by the Board for the appointment of new directors. A proposed candidate is first considered by the N&R Committee which takes into account the skills and experience of the person before making a recommendation to the Board. The process of appointment is detailed out in page 68 of this Annual Report. In accordance with the Company's Articles of Association, one third (1/3) of the members of the Board for the time being shall retire by rotation at each AGM and, subject to eligibility, may offer themselves for re-election. Directors who are appointed by the Board during the financial year are subject to re-election by shareholders at the next AGM held following their appointments. The performance of those Directors who are subject to re-election at the AGM will be subject to assessment whereupon the recommendation is submitted to the Board for decision on the proposed re-election of the Director concerned for shareholders' approval at the next AGM. The Directors are expected to commit sufficient time to carry out his or her role as a Director and also where applicable as a member of the Board Committees. As stated in the Board Charter, the Directors must not hold more than five (5) directorships in listed companies, listed collective investment schemes and issuers of any other listed securities. Currently, none of the Directors serve on the board of more than five other public-listed companies, listed collective investment schemes and issuers of any other listed securities. The Directors are expected to notify the Chairman before accepting any new directorship. The notification should include an indication of time that will be spent on the new appointment. Such information will be shared with the Board members. The Directors are required to update changes to the directorships on yearly basis or immediately after the appointment/resignation as director of other companies. The Board members is informed of changes to the directorships held by its members in public companies at the next Board Meeting upon receipt of the notification by the Chairman/the Company Secretary. Board meetings for the ensuing financial year are scheduled in advance before the end of each financial year to enable Directors to plan ahead and fit the year's Board meetings into their own schedule. The Board has at least four (4) scheduled quarterly meetings with additional meetings being convened as and when necessary. Prior to each meeting, every Director is given the complete agenda and a set of Board papers well in advance so that the Directors have ample time to review matters to be deliberated at the meeting and to facilitate informed decision making. The Board met twenty (20) times during the financial year ended 31 December 2016. All Directors have complied with the minimum requirements of 50% on attendance at Board meetings during the financial year as stipulated in the Main Market Listing Requirement of Bursa Malaysia. The Board has established Board Committees to assist the Board in the running of the Company and the Group. Pursuant to the above, the Board has established five (5) Board Committees. Each committee has clearly defined terms of reference regarding its objectives, duties and responsibilities, authority, meetings and memberships. Any decision not within the authority of the Board Committee is referred back to the Board with its recommendations and comments for the Board's deliberation and approval. The EXCO was established on 29 April 2005 specifically to assist the Board to evaluate and approve loan/financing applications within their approving authority limits. Loans/ financing above the approving authority limit of the EXCO or loans/financing with connected parties as defined in the Guidelines on Related Party Transactions for Directors and Key Management Officers will be escalated to the Board for further deliberation and approval. The oversight and review of restructuring proposals for the recovery of non-performing loans/financing (NPLs/ NPFs), monitoring the progress of the recovery of NPLs/ NPFs and formulation of recovery strategies, is also carried out by the EXCO. The EXCO currently consists of three (3) Independent Non- Executive Directors and three (3) Non-Independent Non- Executive Directors. During the financial year 2016, there were fifteen (15) meetings held by the EXCO. The principal function of the AC is to assist the Board in fulfilling its fiduciary responsibilities particularly in the areas of accounting and management controls and financial reporting and to ensure financial statements comply with applicable financial reporting standards; to reinforce the independence and objectivity of the IAD; to provide the focal point for communication between external auditors, internal auditors, risk managers, Directors and the Management on matters in connection with accounting, reporting, risks and controls and providing a forum for discussion independent of the Management; and to undertake additional duties as may be deemed appropriate and necessary to assist the Board. The AC currently consists of three (3) Independent Non- Executive Directors and one (1) Non-Independent Non- Executive Director. In accordance with the best practices of corporate governance, AC presents its report as set out on pages 89 to 95 of this Annual Report. The Primary objectives of RMC are to assist the Board with the risk oversight within the Group which includes reviewing the risk management policies, risk exposure and limits as well as ensuring that all risks are well managed within the Group's risk appetite by providing adequate infrastructure and resources in place to support the risk management activities. The RMC currently consists of three (3) Independent Non- Executive Directors. During the financial year 2016, there were nine (9) meetings held by the RMC. The primary responsibilities of the N&R Committee are described in pages 66 to 67 of this Annual Report. The N&R Committee currently consists of three (3) Independent Non-Executive Directors and one (1) Non- Independent Non-Executive Director. During the financial year 2016, there were nine (9) meetings held by the N&R Committee. The Option Committee was established on 27 May 2010. The principal function of this Option Committee is to administer the Company's Employees' Share Option Scheme (ESOS) in accordance with the ESOS Scheme's by-laws. The Option Committee currently consists of two (2) Independent Non-Executive Directors and one (1) Non- Independent Non-Executive Director. During the financial year 2016, there was one (1) meeting held by the Option Committee. 1 Cik Ravinder Kaur resigned as Director effective from 31 December 2016. 2 Dato' Jasmy bin Ismail was appointed as Member of Audit Committee on 10 March 2016 and was appointed as Chairman of N&R Committee on 19 January 2017. 3 Encik Sazaliza bin Zainuddin, Datuk Johar bin Che Mat and Puan Lynette Yeow Su-Yin were appointed as Directors with effect from 22 March 2017. 4 Datuk Shahril Ridza bin Ridzuan resigned as Audit Committee member on 22 March 2017. 5 Datuk Johar bin Che Mat and Puan Lynette Yeow Su-Yin were appointed as Member of EXCO on 22 March 2017. 6 Encik Sazaliza bin Zainuddin was appointed as Member of Audit Committee on 22 March 2017. The Board through the N&R Committee undertakes a formal and comprehensive annual assessment on its own performance, individual Directors and its Committees. The N&R Committee reviews annually the effectiveness of the Board and the Board Committees as well as the performance of individual Directors. The Individual Directors assessment forms are distributed to all the Directors and are compiled and the results are presented to the N&R Committee during the Board evaluation process. The results of the assessment are also presented to the Chairman which will include the identification of key areas for improvement and for Board improvement plan. The assessments on the individual Directors are based on both quantitative and qualitative parameters which comprise of the directors contribution to interaction, the quality of their input, understanding of the directors roles as well as the Chairman's role. The assessments of the Board and Board Committees are carried out jointly by the N&R Committee and the assessment comprises the evaluation on the Board Structure, Board Operations, the role and responsibilities of the Board, Chairman's roles and responsibilities as well as the compositions, roles and responsibilities of the respective Board Committees. Upon the completion of the Individual Directors and Board Effectiveness Assessments and identification of the Board improvement plan, the N&R Committee will discuss and determine the training needs for the respective directors. The Directors Orientation and Training Guidelines has been established to encourage the Board members to attend continuous training to enable the directors to effectively discharge their duties. The Board continuously evaluates and determines its' training needs. During the year, all Directors have attended various training programmes, seminars, conferences and talks conducted by Regulatory Authorities, professional bodies and professional trainers and speakers, in order to stay abreast with the latest developments in the industry and business environment as well as on changes to statutory requirements and regulatory guidelines, so as to enhance their skills and knowledge to enable them to carry out their roles effectively. 3. INCEIF "Malaysia as Global hub for fund administration: Potential & Challenges"
6. Knowledge Sharing: How Global Central Banks have borrowed future growth Rate? 8. CEO Faculty Programme on topic "Moving Forward Under Limitations"
9. CEO Faculty Programme on topic "Leveraging University technologies in the finance and fund management industry"
12. 2nd Bloomberg Most Influential Summit Conference on topic Äsian Economic Community A ray of sunshine for Asian Market? 15. 3rd Annual Capital Market 2016 Facilitating Responsible Finance Through Islamic Capital Market in the US – Alternative Funding & Investment Avenues "Prioritising The Next Phase"
17. CEO Faculty Programme – Public lecture topic "The Employees Provident Fund: Issues & Challenges"
18. CEO Faculty Programme – Lecture topic "Managing Provident Funds: The Malaysian Economy"
All Directors with the exception of the two (2) newly appointed Directors, have attended the MAP as required under the Main Market Listing Requirements of Bursa Malaysia. The two (2) new Directors, Puan Lynette Yeow Su-Yin and Encik Sazaliza bin Zainuddin, have registered to attend the MAP by 2nd quarter 2017. The Directors are also regularly updated on any changes to legal and governance requirements which will affect the Group and also themselves as Directors. The Board acknowledges its responsibility to ensure that the Company's and the Group's financial statements present a true and fair view of the state of affairs and are prepared in accordance with Malaysian Financial Reporting Standards ("MFRS"), International Financial Reporting Standards ("IFRS") and the provisions of the Companies Act, 2016. The Board is also committed to providing the highest level of disclosure possible to ensure integrity and consistency of the financial reports. The Group publishes full financial statements annually and condensed financial statements quarterly as required by the Main Market Listing Requirement of Bursa Malaysia. The AC assists the Board in scrutinising the information for disclosure to ensure accuracy, adequacy and completeness. The AC is responsible to review and monitor the suitability and independence of external auditors annually. The External Audit Policy and Procedures on the assessment of external auditors had been established to provide guidance to the Group on the processes and procedures to review the independence of the External Auditors. The review should encompass an assessment of the qualifications and performance of the auditors, the quality and the auditor's communication with the AC and the Group, the auditor's independence, objectivity and professional skepticism. The external auditors appointed by the Group should meet the qualification criteria as set out in the External Audit Policy particularly the audit engagement team involved in making key decisions on significant matters. The AC should also ensure that the provision of non-audit services by an external auditor does not impair, either in fact or appearance, the auditor's objectivity, judgement or independence. The AC was satisfied with the suitability of Messrs Ernst & Young ("EY") based on the quality of service and sufficiency of resources they provided to the Group. The AC was also satisfied with its review that the non-audit services provided by EY for financial year ended 2016 did not in any way impair their objectivity and independence as external auditors of the Group. The AC had carried out the annual assessment on the external auditors and had recommended to the Board for consideration for further recommendation to the Shareholders for approval at the 47th AGM on the appointment of EY as external auditors of the Group for the financial year ended 2017. The Group had then recommended for the external auditors, Messrs Ernst & Young to continue to provide the independent assurance to shareholders on the Company's and the Group's financial statements. The Board maintains a formal and transparent relationship with the auditors to meet their professional requirements. The role of the AC in relation to the internal and external auditors is described in the AC Report section of the Annual Report. The Board is ultimately responsible for risk oversight within the Group through the RMC. The RMC is responsible to periodically review the Risk Management policies, risk exposure and limit whilst ensuring infrastructure and resources are in place. Management Committees such as MANCO, CARAC, ALCO, IAR and IT Steering Committee assist the RMC in managing credit risk, operational risk, market risk, liquidity risk and other material risk. The Group continues to maintain and review its internal control procedures to ensure proper oversight of the Management of all risks. The Board has the overall responsibility of maintaining a sound system of internal controls to safeguard shareholders' investment and the Company's assets. The AC through the IAD reviews the effectiveness of the system of internal controls of the Group periodically. The review covers the financial, operational and compliance controls. The details of the Internal Audit functions are listed in pages 91 to 92 of this Annual Report. 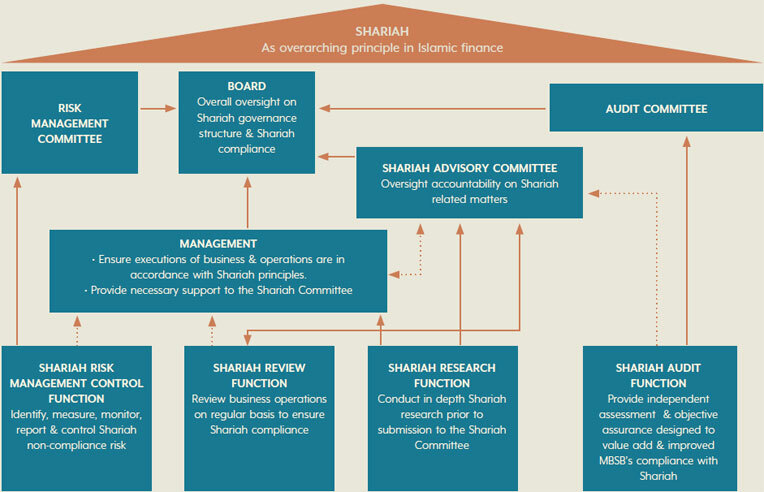 The Board has established and implemented a comprehensive Shariah Governance Framework since 2013. Since the introduction of the Shariah Governance Framework, MBSB has achieved significant milestones towards institutionalising governance structures, policies and processes to promote end-to-end Shariah compliance in its Islamic finance operations. There are 5 Shariah experts who are providing oversight over MBSB Islamic products & operations. MBSB has also implemented Shariah risk management control functions and dedicated resources to manage Shariah non-compliance risks within the Islamic financial system. Efforts to further strengthen Shariah Governance standards remain a priority to MBSB as good governance models and practices evolve in tandem with the growing complexity of the Islamic financial industry. As such, the Shariah Governance Framework for MBSB envisions the future of Shariah Governance impacting business model and strategy of MBSB as an Islamic focused financial institution as well as driving innovation of valueadding Islamic financial products through effective implementation of the Shariah contract-based regulatory framework. The Board acknowledges that timely, complete and accurate disclosure is crucial to fair and orderly trading of securities. Hence, the Group is committed to provide the investors with high quality information on a timely manner. The Corporate Disclosure Policy of the Group is in place and it has set out the policies and procedures for disclosure of all material information to be released to the investing public. Clear roles and responsibilities of the Directors, Management and employees are provided in the Corporate Disclosure Policy and the designated spokesperson responsible to communicate with all audience of the material information/announcement to internal and external stakeholders had been identified. The Board of Directors, Management and employees of the Group are required to observe this Corporate Disclosure policy. The Group is mindful and will ensure timely disclosure of material information in accordance with the Bursa Malaysia's and other applicable legislation. MBSB has a website at www.mbsb.com.my which provides updated information on the corporate and business aspect of the Group. Press releases, announcements to Bursa Malaysia, analysts briefings and quarterly results of the group are also made available on the website and this helps to promote accessibility of information to the company's shareholders and all other market participants. MBSB also provides an abridged version of the Annual Report together with its Annual Report in CD format, highlighting key financial information to facilitate shareholders' easy access to such key information. The AGM of the Company is the principal forum for dialogue and interaction with its shareholders. Shareholders are given the opportunity to participate effectively in resolutions tabled at the AGM. All shareholders have direct access to the Board members at this AGM. In addition, the senior management, external auditors and other advisors are present at the AGM to provide answers and clarifications to shareholders. The notice and agenda of AGM together with Form of Proxy are given to shareholders at least 21 days before the AGM, which gives shareholders sufficient time to prepare themselves to attend the AGM or to appoint proxy to attend and vote on their behalf. Each item of special business included in the notice of AGM will be accompanied by an explanatory statement on the effects of a proposed resolution. In line with the best practice in Corporate Governance and subsequently the MMLR, voting at the AGMs since 2014 was conducted by poll instead of by show of hands. Poll voting fairly and accurately reflect the view of the shareholders by ensuring that every vote is recognised and this practice will enforce greater shareholders rights and it is consistent with the 1 share 1 vote principle. The voting slips were issued by the Share Registrar upon registration, and were pre-printed with details of shareholders' name, identity card number/company number and total number of voting shares held. The polling process for the resolutions was conducted upon completion of deliberation of all items to be transacted at the AGM. The results of the poll for each resolutions including votes in favour and votes against were announced by the Company Secretary, upon which the Chairman declared whether the resolutions were carried. The results were also announced via Bursa Malaysia on the same day for the benefit of all the shareholders. The Minutes of AGM were also made available on MBSB's website. All the Directors were present at the last AGM which was held on 5 May 2016. The proceedings of the AGM included the presentation by the PCEO of the Group's financial performance to the shareholders and the Questions and Answers session during which the Chairman invited the shareholders to raise questions pertaining to MBSB's financial statements and other pertinent questions before putting a resolution to vote. The Directors, PCEO, Management together with the external auditors and advisers were in attendance to respond to the shareholders' queries. The PCEO also shared with the shareholders the Company's responses to questions submitted in advance of the AGM by the Minority Shareholders Watchdog Group. The Officers of the Company were also present at the AGM to handle other enquiries from the shareholders. The Directors are required by the Companies Act, 2016 to prepare financial statements for the financial year which have been made out in accordance with the applicable MFRS, IFRS and the provisions of the Companies Act, 2016 in Malaysia and give a true and fair view of the state of affairs and of the results and cash flows of the Company and the Group for the financial year then ended. In preparing the financial statements, the Directors have used appropriate and relevant accounting policies that are consistently applied and supported by reasonable as well as prudent judgements and estimates, and that applicable MFRS and IFRS have been complied with. The Directors are responsible for ensuring that the Company and the Group keep proper accounting records which disclose with reasonable accuracy the financial position of the Group and Company and which enable them to ensure that the financial statements comply with the Companies Act, 2016. The Directors have the general responsibility for taking such steps as are reasonably open to them to safeguard the assets of the Group, to detect and prevent fraud and other irregularities. The net proceeds raised from DRP (after deducting the estimated expenses for DRP) are for the purpose of funding of the working capital and/or other requirements of the Group. Apart from the annual audit fees, the Group has incurred other assurance related fees of and non-audit fees paid or payable to external auditors of MBSB, Messrs Ernst & Young or its affiliates for the financial year ended 31 December 2016. Save as disclosed in note 35 to the financial statements, there are no other material contracts subsisting at the end of the financial year or entered into since the end of the previous financial year by the Company and its subsidiaries which involves interests of the Directors, PCEO and major shareholders. The Company has adopted a 30% dividend payment ratio on profit after tax. * The number of ESOS options was adjusted to reflect the changes in the fraction to the ESOS options in accordance with the issuance of the Rights Issue with an entitlement date of 24 June 2016. The number of shares allocated, in aggregate, to the Directors and senior management of the Group shall not exceed 50% of the total Company's shares available under the scheme. As at 31 December 2016, the actual percentage of total options granted to senior management of MBSB under the ESOS was 15.31% of the total ESOS granted. Details of the ESOS during the financial year 2016 are set out under Note 22 of the Notes to the Financial Statements in this Annual Report. Having reviewed the governance structure and practices of the Company and the Group, the Board considers that it has complied with the best practices as set out in the Code as well as the items set out in Part A of Appendix 9C of the Main Market Listing Requirements of Bursa Malaysia in relation to the requirement of a separate disclosure in the Annual Report. This Statement on Corporate Governance was approved by the Board of Directors on 22 March 2017.